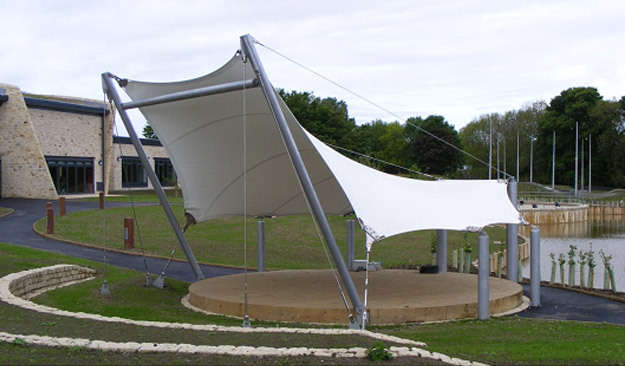 Miko Engineering had already secured a sub-contract to supply street furniture and cycle shelters on this project when they were also asked to supply a bandstand canopy. Miko approached AJ Tensile as a specialist subcontractor for assistance with the design, engineering and fabrication of the tensile fabric membrane, and used AJ Tensile’s canopy concept as the basis for the design of the support steelwork. AJ Tensile fabricated the PVC roof membrane and supplied the stainless steel cables and associated hardware. Miko Engineering erected the steel support frame and fabric canopy themselves under the direct supervision of AJ Tensile’s project manager to ensure a smooth and trouble-free installation.